New from Finland the Primaster Combi 2 in 1 scrubber enables you to clean narrow and difficult to access areas quickly and effectively without the annoying presence of electric cables. The machine is extremely lightweight at only 3kg including the battery. A 9.6v rechargeable battery and separate 1 hour quick-charger make the Combi Machine the perfect item to carry on your cleaning trolley or an ideal combination with bigger cleaning machines. The 180mm brush and free space around the motor allows the Combi Machine to clean skirting boards, walls, ceilings and right into corners etc. 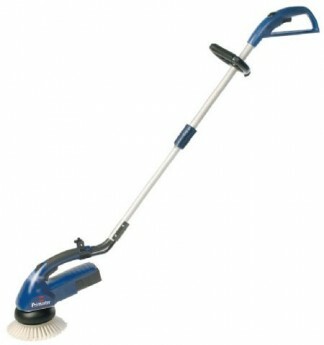 This means all those hard to clean and difficult to reach nooks and crannies can be comfortably cleaned by machine.